When life gets hectic, rediscover the benefits of a quick, down-and-dirty spin. 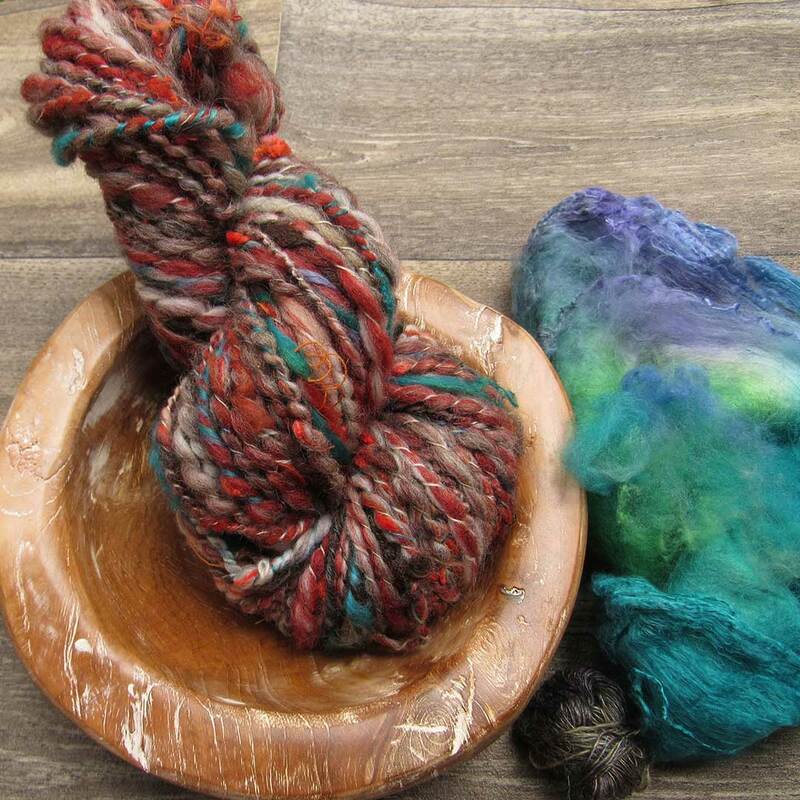 Sit at the wheel, fiber in hand, with nary a plan, nor even a purpose, in mind, other than satisfying the itch for a bit of time spent making handspun yarn. 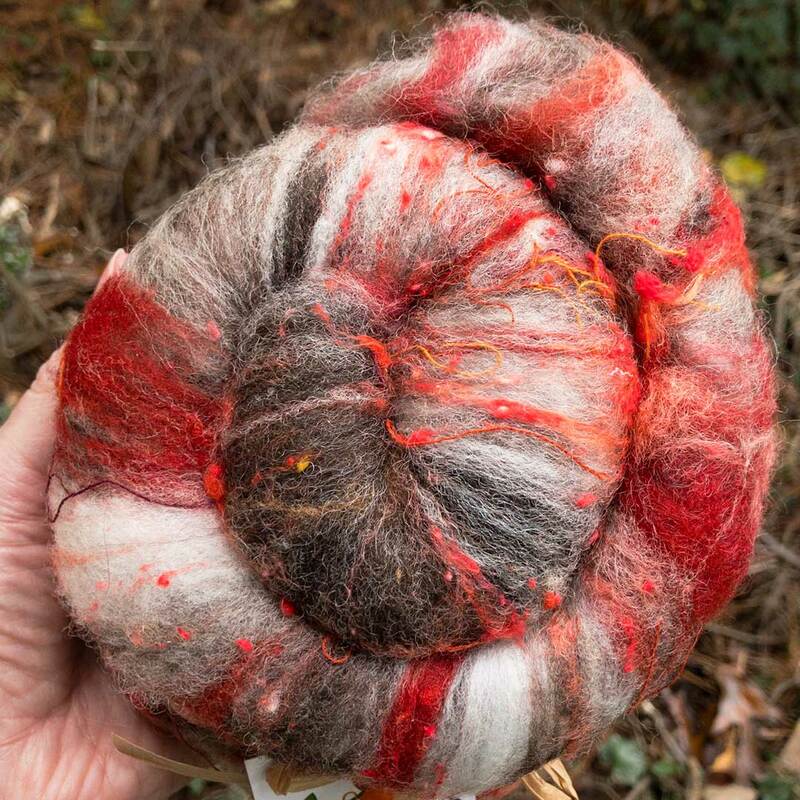 Between work deadlines and a move, my palette-cleansing spin included a BricoBatt by Bricolage Studios in the Fire Dot Lichen colorway. 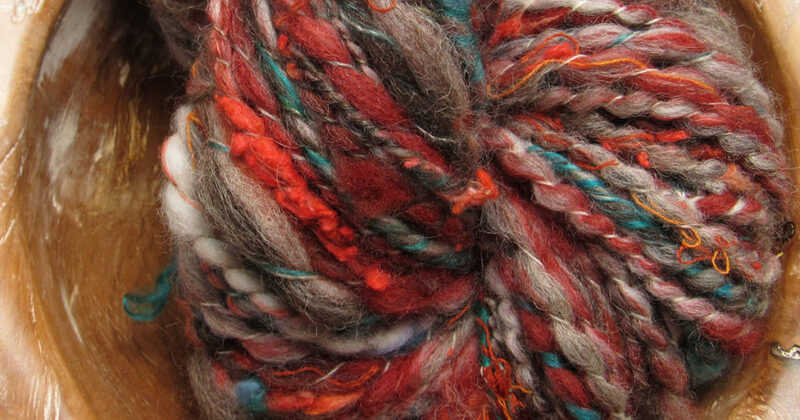 I was drawn to this batt’s bright, coppery pops of color and the unusual mix of fine, yet toothy, wools. I find battmaker Emily Wohlscheid’s style of repurposing textural components in her carding process—such as yarn, scraps of denim, and ribbon—intriguing. A BricoBatt by Bricolage Studios in the Fire Dot Lichen colorway. I decided to spin up the batt into a lofty, textured (dare I say art) yarn. I spun a thick, low-twist singles yarn and spiral-plied it using a bit of leftover Merino/silk singles in a coordinating color. Then, I attempted to add glazing wisps—or, in my case, chunks—of a bright, emerald-green silk hankie (affiliate link) at the same time I plied. While the finished yarn is slightly underplied for my tastes, I still dig it! So, what did I gain from this exercise? I managed to spin a lofty, soft yarn in double drive, a system I am still exploring, and I got a refresher in spiral plying—a technique I had not worked before on this particular wheel. Best of all, I spun up yet another, albeit small, item from my stash, leaving me feeling just a bit virtuous. Colors, fibers, or preparations outside your normal range. Thicker or thinner yarn gauge. 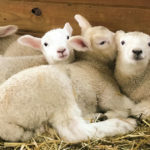 Making handspun yarn with intention is certainly fulfilling, and I intend to continue, but an occasional quick spin provides not only a skill-building lesson, but a chance to really let go. What will you spin next?